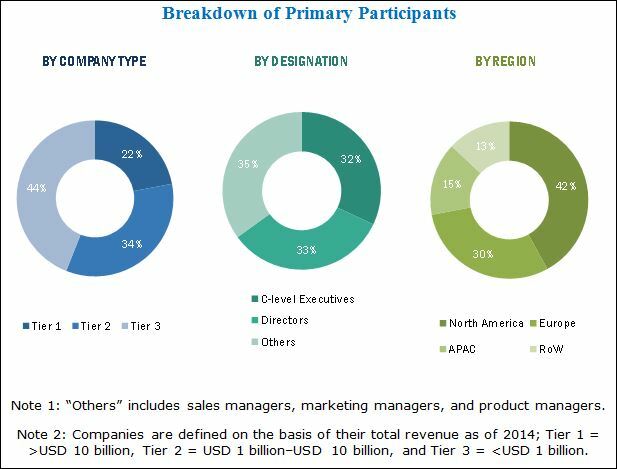 [146 Pages Report] The digital out of home (DOOH) market, was valued at USD 12.52 Billion in 2016 and is expected to reach USD 26.21 Billion by 2023, at a CAGR of 10.7% during the forecast period. The base year considered for the study is 2016 and the forecast period is between 2017 and 2023. This report provides valuable insights into the ecosystem of the digital out of home market. The major players in this market include JCDecaux (France), Clear Channel Outdoor Holdings, Inc. (US), Lamar Advertising Company (US), OUTFRONT Media (US), Daktronics (US), Prismview LLC (US), NEC Display Solutions, Ltd. (Japan), oOh!media Ltd. (Australia), Broadsign International LLC. (Canada), Stroer SE & Co. KGaA (Germany), Mvix, Inc. (US), Christie Digital Systems USA, Inc. (US), Ayuda Media Systems (US), Deepsky Corporation Ltd. (Hong Kong), and Aoto Electronics Co., Ltd (China). In today’s modern dynamic world, digital out of home has changed the face of outdoor advertising. Digital out of home encompasses a variety of screen shapes, sizes, and levels of interactivity. There is a huge demand for digital out of home, which is growing as a medium for promotion among the large masses. 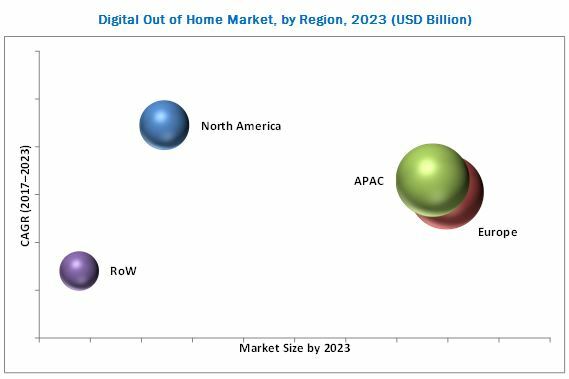 The digital out of home market was valued at USD 12.52 Billion in 2016 and is expected to reach USD 26.21 Billion by 2023, at a CAGR of 10.7% during the forecast period. Digital out of home advertising is a part of the larger multiscreen ecosystem that effectively displays a message, creating a deeper level of engagement with the consumers. Increasing availability of media options in recent years has fragmented audiences, making it challenging for advertisers to reach their target markets. Digital out of home media connects with consumers in captive locations, such as elevators, health clubs, and restaurants. Digital advertising is growing at a quicker pace, and media companies are considering digital out of home as the biggest catalyst, which would drive the growth of the digital out of home advertising. Increasing deployment of DOOH solutions helps the tourism and hospitality industries to grow further. The growth of retail centers and advent of digital technology have made a positive impact on the DOOH market globally. However, the increased online/broadcast advertisement and lack of standards for interoperability between devices are restraining the growth of the DOOH market. Deployment of DOOH solutions has increased rapidly across the globe. Technological innovations such as touch screen technology, near-field communication (NFC), and beacons have created opportunities for this market. The growth of the DOOH market is mainly dependent on the quantity and quality of the information viewed by individuals from different locations. The digital out of home displays capture more attention than the printed media; it is also cost-effective in the long run, as there are no additional costs required to change content. In 2016, the digital out of home market was dominated by JCDecaux (France), Lamar Advertising Company (US), Clear Channel Outdoor Holdings, Inc. (US), OUTFRONT Media (US), Prismview LLC (US), and Daktronics (US). Other major players in the digital out of home market include NEC Display Solutions, Ltd. (Japan), Stroer SE & Co. KGaA (Germany), Broadsign International LLC. (Canada), oOh!media Ltd. (Australia), Mvix, Inc. (US), Christie Digital Systems USA, Inc. (US), Ayuda Media Systems (US), Deepsky Corporation Ltd. (Hong Kong), and Aoto Electronics Co., Ltd (China). 11.2.2 Clear Channel Outdoor Holdings, Inc.
12.6 Clear Channel Outdoor Holdings, Inc.
12.12.1 Chrisitie Digital Systems USA, Inc.
12.12.4 Aoto Electronics Co., Ltd.